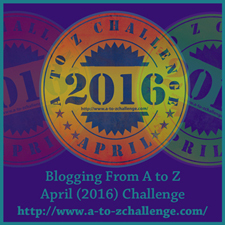 Ruth Ozeki offered twenty writing prompts in her preface to Choices (Borderline Press, 2016) which I am using as my platform for the A-Z Blogging Challenge. Twenty-six letters, twenty prompts, leaving six days unassigned. I’m not ready for what Ozeki calls her Social Project prompts: “Find a way to end global warming. Make it work” (#16) and “Find a way to end poverty. Make it work. “(#17). When I complete them––I’ll use her library prompts, my favorites, as rewards. Since I was already planning a library visit, why not make my own prompt? Go to the history room of the library in your hometown and sleuth out information about Civil War veteran George Reuben Anderson––your great-grandfather. Ask the librarian for help. Never mind about the family tree stuff. Look for personal information. I made my prompt a nimble container because, sly cover-up artist that I am, I wrote it after conducting research. I have a binder full of information of basics about George: born in Ohio in 1857, 14 years old when the Civil War broke out, got his parents permission to enlist at 16 in the Kansas Light Artillery, was wounded in two battles, returned to Kansas, worked with his father as a harness maker, was a founding member of the Topeka chapter of the Grand Army of the Republic (the GAR, a vets organization that existed into the 1940s), moved to California, married Libby Kent ––my great grandmother––in 1877, fathered eight children one of whom was my grandmother, Martha Louise Anderson, a single woman who adopted my mother, Ruth Raemer Anderson (not a single woman)—she married Leslie Quinby in 1927––and they adopted me. At the History Room in Visalia, library staff member Jennifer Spurlock tracked down a registry of veterans for the local GAR Post 111 and retrieved it from the library’s vault. She pointed to the graceful cursive handwriting of an unknown scribe who, over 130 years ago, had registered new members. My great grandfather’s name was number ten. She also found photographs, located the original 1899 book containing a two-column biography about G.R., and set me up with Digital Reel, a newspaper database that had dozens of references about G.R. Anderson. My excitement was instant, palpable, commanding, but the software was exceedingly slow and my time limited. Some articles were difficult to find in the close weave of blurred digitized print. I downloaded some to a flash drive and opted to tease myself with the abbreviated lines that appeared in the electronic index of a now defunct newspaper, The Visalia Daily Times. I offer three, reproduced exactly as they appeared on the screen–enigmatic enough to demand a return trip to prospect for more archival gold. Why did he receive a gold watch and chain? What’s this about a hold-up and which daughter saw it? Was it their daughter Anna, my great aunt, who went to visit G.R. and his wife Libby, and what was she recovering from? If I have a take-home question it is this: do you have someone in your background, someone you may have never met that you would like to find out about? My take-home answer is this: find a librarian who can assist with your Sherlockian journey. The quest is energizing. You are a research queen! Looking forward to hearing more about G.R. Thanks for reading my post, and more especially for your assistance. Hope to see you again sometime when I get to Visalia!